Whether you're lucky enough to be from bonny Scotland yourself or just have a penchant for the Highlands, Bingo Scotland is a fantastic place to enjoy some gaming fun. 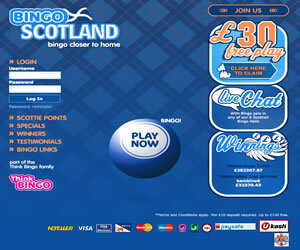 Bingo Scotland describes itself as the leading UK bingo game for Scots everywhere; but no matter where you are located or originally from in the UK, you will still feel right at home when arriving at the Scottish-themed site. The typically blue, tartan-style interface evokes the obvious Scottish theme that the site wants to achieve, but it also means the site appears quite neutral and therefore appeals to a wider demographic than some of the cuter, fluffier sites out there. The cross of St. Andrew also features heavily in the logo and across the site, furthering this theme. The home page very clearly displays the sites main features and navigation around the site is extremely simple and easy to get used to. 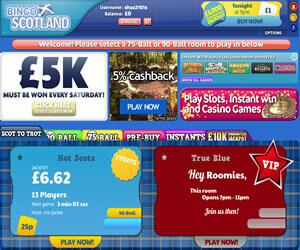 Bingo Scotland runs on 888/Globalcom software which is amongst the best on the market and provides a fast and smooth platform on which to enjoy the games on offer. Signing up at Bingo Scotland is extremely straightforward and new members are entitled to a welcome bonus which is competitively pitched when compared to others on the market. The site also pays out reload bonuses on subsequent deposits which is great for customer retention and keeping regular players on side. Bingo Scotland offers regular 90 and 75 ball games as you would expect. In terms of improvement, perhaps the site could try and incorporate other bingo games such as speed bingo or Swedish five line games. Guaranteed jackpot games are also scheduled throughout the week with an informative timetable accessible via the promotions page at the site. Regular weekly and weekend promotions are also designed to keep players interested and include many bonus point prizes. They also offer a range of complementary instant games as you would expect, including popular slots such as Fluffy Favourites and Shaman's Dream. The Bingo Scotland team seem particularly proud of their Loyalty Club, where members earn Scottie Points. Players pick up loyalty points in a number of ways and in a similar fashion to other sites; this can be achieved mainly through card purchases but also through playing chat games and the popular Refer-a-friend scheme which has been used across many different sites. The scheme falls in line with many other loyalty schemes out there and adds an additional reason for customers to keep playing at the site. 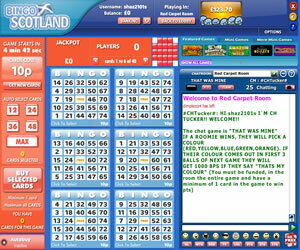 Bingo Scotland has been live since 2008 and has a distinct and consistent theme which may appeal to some but not others. However, the games on offer are of an adequate standard so even if you're not from the Highlands you can still enjoy a good game at the site. We do feel that targeting such a small part of the UK demographic might not work in their favour in the long run '“ certainly in such a crowded market. 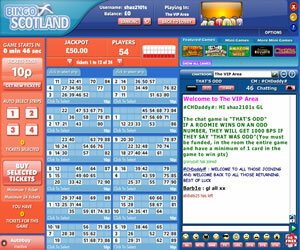 Bingo Scotland offers three variants of the bingo game at their site. Most games are either 75 ball pattern or 90 ball bingo but the brand does have one room that offers 75 ball five-line games too. Although part of a network there is also one room that is available only to players who have signed with this brand. For any of the deposit bonuses you have to deposit at least £10. Wagering requirements at Bingo Scotland are 2x the amount of deposit and bonus but you can withdraw prior to meeting these requirements. However, should you not have met the wagering then your bonus money in your account at the time of withdrawal will be lost. Before you can withdraw you must have deposited at least £20 into your account.